Then we give a series of easy steps for change the oil in your car. They are tasks you can do yourself, even if you do not have time and you do not want to stain your hands, it is best that you take it to your workshop confidence (in less than an hour change it). 1. Ideal engine temperatureBefore proceeding to all tasks, it is essential that the engine temperature is optimal (around 90). To do this, you can start the engine for a while or simply run for a few minutes with your car until you see the needle mark desired temperature. 2.- Car Preparation: To make the oil change to your car, you must raise it a few centimeters from the ground. To do this, you can use a pair of Portable ramps and wedges. Ramps should be placed on a raised surface and on them you must run your car until the front wheels are right on them. Just then, the parking brake, the engine shuts off, insert the first gear (or neutral mode if automatic) and behind the front wheels placed wedges so that the car does not take back. 3.- Drain plugIn this step, you must locate the drain plug at sump (You can identify because it is a metal deposit beneath the engine, and sometimes as the car may be covered in turn by a cover protects-shock from plastic also called crankcase cover). You will see the plug It is subject to a nuts in the corners. If you're not sure where it is, in the operating technical specifications of your car usually come printed illustrations with many of the engine parts. Once located and said plug before opening, you must place a picker or one bucket to collect waste oil. Ponte a gloves to avoid mancharte and above all to protect you, because you access engine parts may be hot. 4.- Emptying oil: the desaflojar the nuts, You can unscrewed he plug and the oil will fall quickly to container or bucket you have placed previously. It takes a while to empty all waste oil that under normal circumstances usually reach an amount between 4 Y 5 liters. 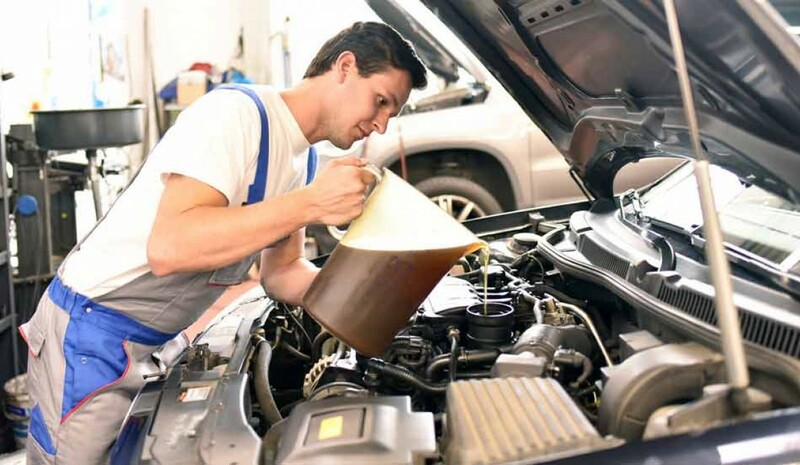 5.- Oil filter: Lifts hood from your car, secure it and locate the oil filter (You can also locate the oil filter below the car if said filter is to one side of the engine block). To unscrew it, you must use a key as. Before screwing the new oil filter, impregnated with a some oil he rubber stamp. Placed manually oil filter in place and proceed to screw it with the key you had used seconds before (do not overdo strength to do because you can pass thread). 6. Fill with new oil: Before filling the reservoir with the new oil, and make sure that no drips no drop by plug of the sump. Go back to fix and tighten said cap in its original place and proceeds to filling the tank with the new oil through the filler cap located on top of the engine. The recommended amount of oil is indicated in the maintenance manual car (usually about 4 liters). 7. Tests and checks: With the car and lowered the ramps, starts the engine and sometimes you may have on the oil witness. Shuts off the engine, open the hood and check through dipstick that he marked level is a intermediate position between maximum and the minimum. Then, when restarting, the signal light oil warning light will be gone. 8. What to do with the Old oil or used? All the old oil deposited in the bucket or container, save or throw it in a carafe about 5 liters. This oil is a intoxicant, so to properly remove this residue, it is best to turn to one workshop where they proceed correctly disposal / recycle East residue as stipulated by the environmental laws. Questions: what revolutions have to change gears? Doubtful: change oil in a car, how much is in a manual and an automatic? Questions: Is it good to fill again and again to save on oil change?